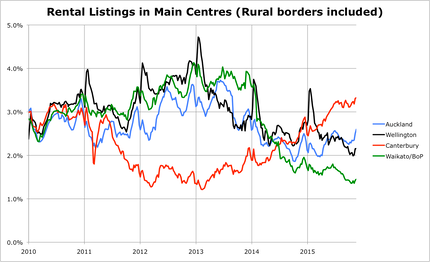 Looking about the regions, the markets are all extremely different. 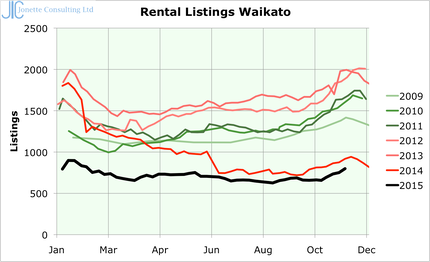 �The following charts are of the major regions, which are all in different parts of the housing cycle, with Auckland now clearly at the end of the cycle with rents likely to drop, Wellington is just starting to show a shortage of houses but Waikato and Bay of Plenty are seriously short of houses! 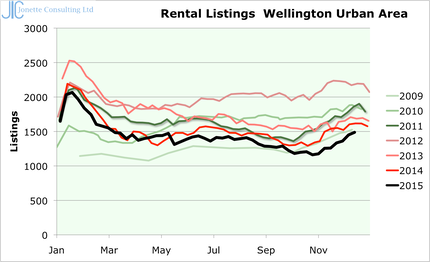 Wellington in contrast is now 3 months into record territory with a shortage of supply or an increase in demand leading to listing shortages and likely rent rises. �This corresponds with anecdotal evidence of a hot housing sales market. The Bay of Plenty and Waikato however have a severe shortage of listings and demand well below supply. �Waikato down to about 25% of previous supply only 2 years ago, and Bay of Plenty with less than 50% of previous supply. 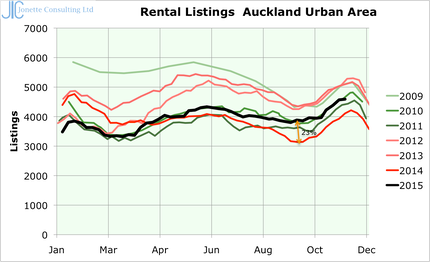 Expect rampant price increases in these regions for both rentals and sales. �It is difficult to imagine any other response to a shortage of living spaces in these two cities. 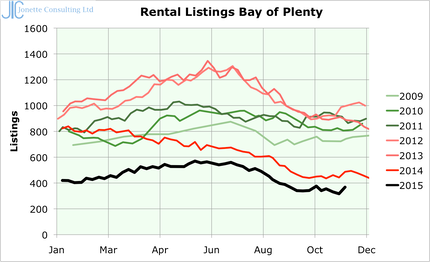 And finally a chart I like to view, listings as a percentage of rentals in each region (rental numbers taken from Stats dept with two data points, 2006 and 2013). �This shows the four regions including Christchurch in relation to each other, demonstrating the impact of over-building in Christchurch leading to an excess supply compared to demand. �It would appear from this chart that balance is about 2.5% where demand = supply. Waikato/Bay of Plenty is as short of houses as Christchurch was after the earthquake!